GitHub - kesne/jeopardy-bot: ​A Slack bot for Jeopardy! games. Want to be notified of new releases in kesne/jeopardy-bot? 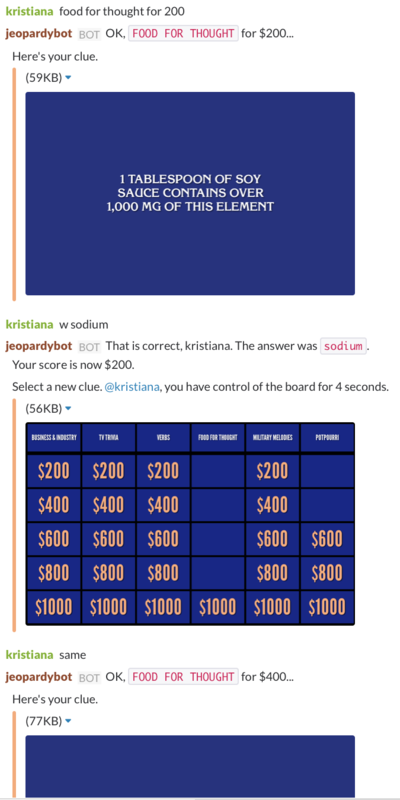 A Slack bot that lets you play full Jeopardy! games. Easy to deploy, and highly configurable to your team's style of play. Deploying with now is simple, and there is a free tier that you can use to run the Jeopardy Bot application. Follow the Getting Started guide. Run now in the project to deploy it: $ now. You will be prompted to provide a SLACK_TOKEN. You're good to go! Invite the bot into a channel on slack, and start a game by saying "new game"! A docker image containing the bot is published and can easily be used as well. You will need to create a SLACK_TOKEN for the bot, and provide it via an environment variable when running the container. When in doubt, just type "help" in the channel and a message will appear to help you out. “help” - Displays this helpful message. “new game” - Starts a new game. “end game” - Ends the current game. “scores” - Shows the scores for the current game. “leaderboard” - Shows the scores for the top players. “loserboard” - Shows the scores for the bottom players. You can also ensure that the bot is awake by messaging "poke". This is useful for free Heroku dynos, which may get shut down after inactivity. The slack bot is configured via slack commands. To explore the configuration options available, simply say "config". Persistence works out of the box by periodically uploading a dump of the configuration to slack itself. The sync occurs every 5 minutes, and whenever the process is gracefully exited. If the process exits and is unable to sync, it may lose up to 5 minutes of data.